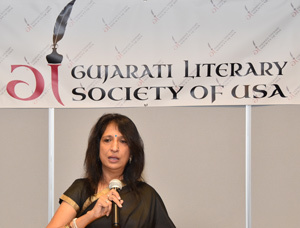 (Left) Kajal Oza Vaidya and Shobhit Desai with Gujarati Literary Society of USA members at their inaugural event. 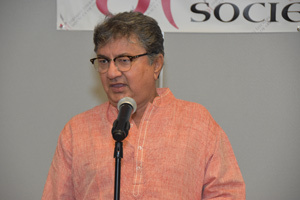 In a sincere attempt to not only salvage but rekindle the love for Gujarati literature in the Southeast, the Gujarati Literary Society of USA had a great showing at their maiden event on Saturday, June 17, 2017 at the Lucky Shoals Park Community Center, Norcross, Georgia. For recitations and reflections by Gujarat’s two very iconic writers, Kajal Oza Vaidya and Shobhit Desai, the attendees delightfully showed up on time and were equally resistant to leave, wanting more of the same, even after the presentation was over. With modestly priced tickets at $20 each, which also included fresh Marco’s pizza, soft drinks, and nachos for snacks, the founders reached into their pockets to cover the overhead, without a complaint or criticism—all for the love of writing. 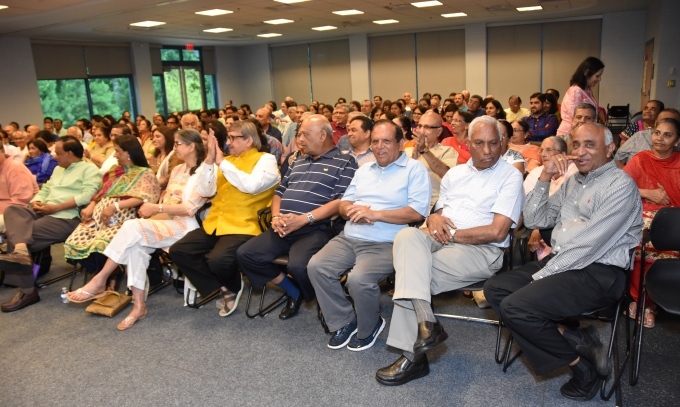 Excellent attendance at the inaugural event of the Gujarati Literary Society of USA. With theater style seating, sans the elevation, and simple microphones, the performers did not care for anything other than enthusiastically sharing their work with fans and drawing upon their energy to excite the delivery further. 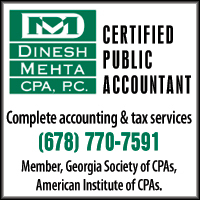 After introductions of the founders (Mustafa Ajmeri, Jatin Shah, Chirag Thakkar, Nimesh Sevak, and Sanjay Pandya) and the sponsors (Dhaval Shah of Peach Clinic, Kala Gurjari, Vaishnav Samaj Atlanta, Gujarati Cultural Association of North America, Marco’s Pizza, Embassy National Bank Chairman Nitin Shah, and Dr. Prakash Desai), the program began with the introductions of both the literary icons of India, known throughout the world for their work. Kajal Oza Vaidya (left) told about the real life incidents that became inspirations for her written work, be it a short essay for her press column or for one of her many books or her script for TV serials or even her films. Not being shy of controversies, she wrote about very challenging and controversial feminine subjects but with fine tenderness. She claimed quite candidly that she is not a feminist but is most certainly feminine enough to raise Cain about treatment of women over a variety of issues. She has written more than 50 books, including novels, plays, and more. Some of her notable ones include Krishnayan (about Lord Krishna in human form), Draupadi (the strength of a woman amongst men warriors), Yog-Viyog, Purna Apurna. Dressed in a stark black saree with a few decorations, her delivery was soft yet subtle, sweet yet strong, and extremely riveting, to say the least. Shobhit Desai (right) is equally well known for masses of poetic works, yet best known for analyzing the famous poet Mirza Ghalib. From creating public relations work for the Prime Minister’s campaigns to accompanying Pandit Jagjit Singh as emcee, to confronting the wrong in society through poetry, his is a fiery brand and his accented delivery is very awakening and enlightening for listeners. He began with some of his more serious poems and quickly shifted to the romantic and humorous works. Two collections of his poems were also released. 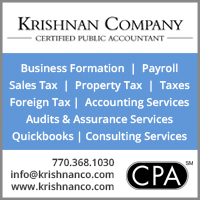 Both presenters were well received and the audience left with a promise that they will appear again in Atlanta soon. 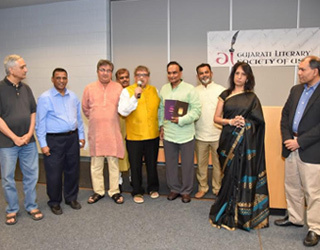 (Left) Shobit Desai’s book inauguration: with Sanjay Pandya, Mustafa Ajmeri, Shobhit Desai, Nimish Sevak (in back), Dr. Prakash Desai, Nitin Shah, Jatin Shah, Kajal Oza Vaidya, and Dr. Dhaval Shah. 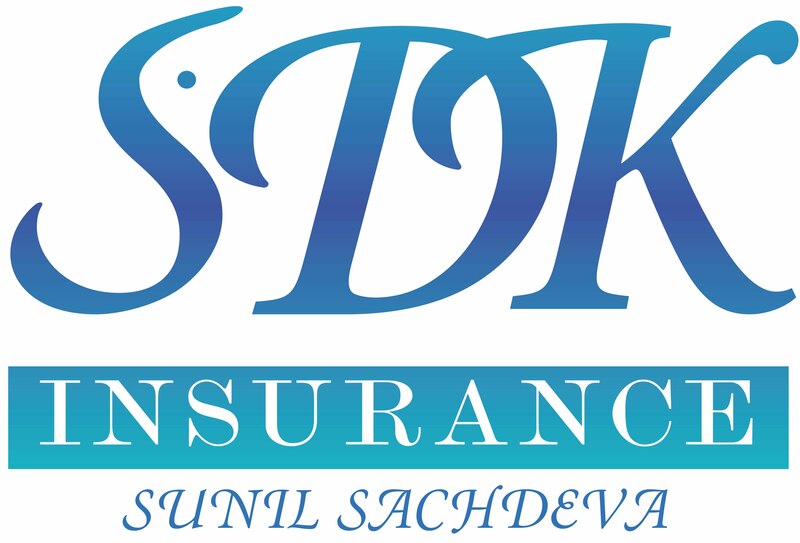 Meri Preet Meri Reet - Speech by Kajal Oza Vaidya.